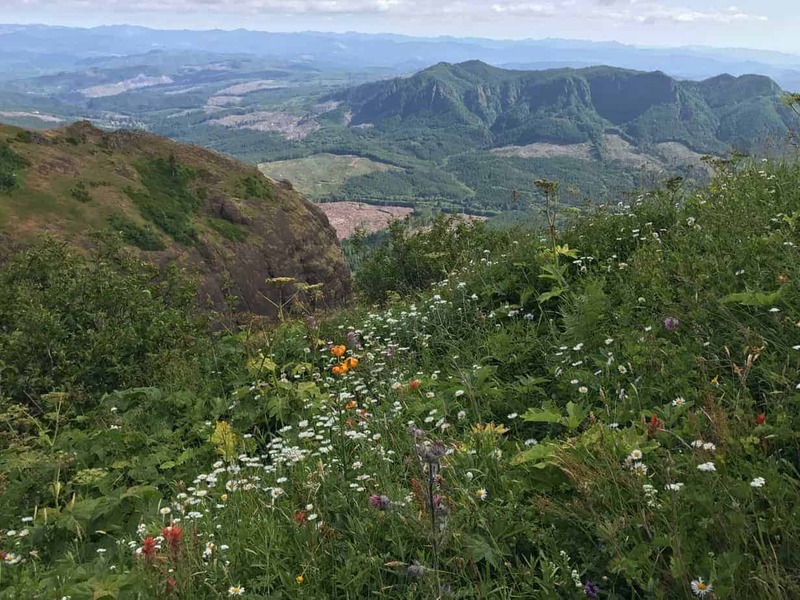 Every year in early summer, the Portland-area hiking cycle takes one to Saddle Mountain, just off US 26 on the way to the Oregon Coast. 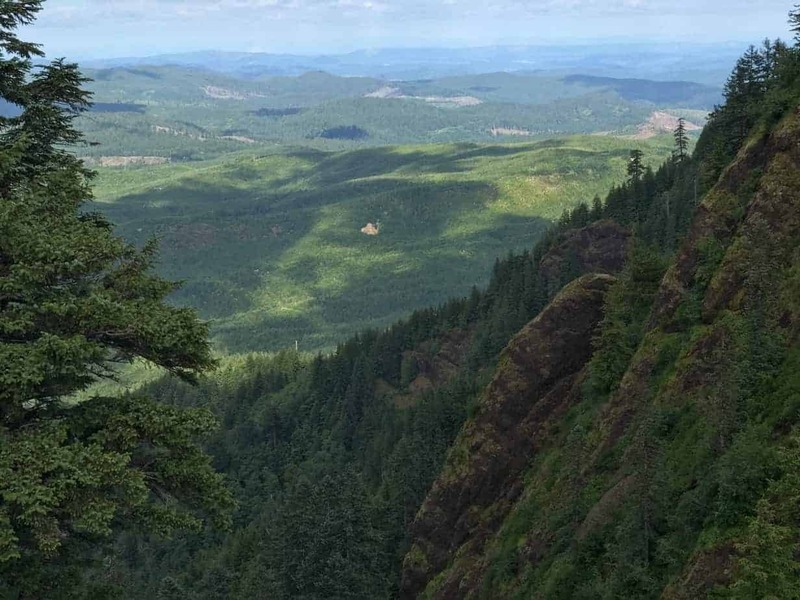 It is typically in late June — when the Gorge flower show is done and the higher trails haven’t melted out yet — that the open peaks of this Coast Range hike explode with color. 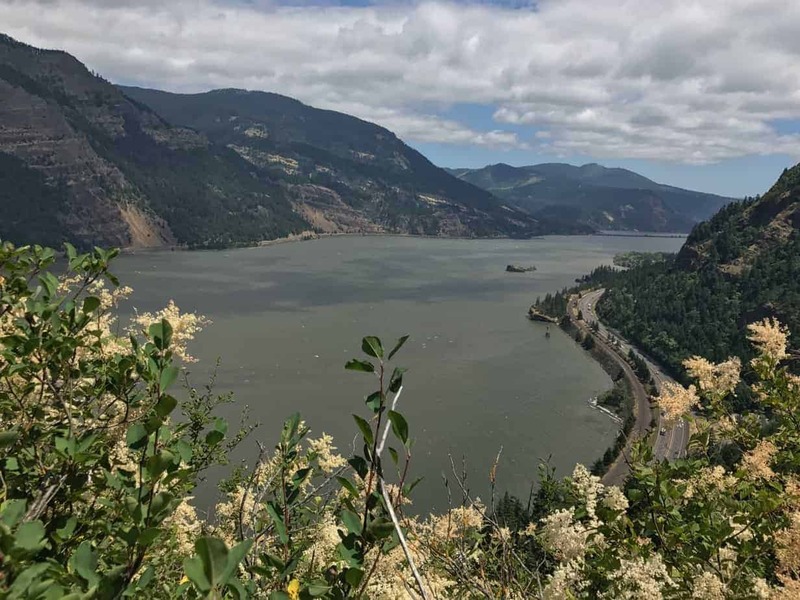 And, if you are really lucky, you’ll get clear weather up there and see a whole mess of volcanoes, as well as the coast, the mouth of the Columbia River, and the town of Astoria. To top it all off? One of the great dining and cultural experiences around is just down the road. 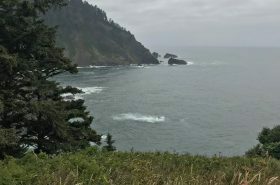 It’s a bit of a drive for a barely six-mile hike, so think about doing it on the way to or from the coast. This stump at the trailhead shows what the forest used to look like. 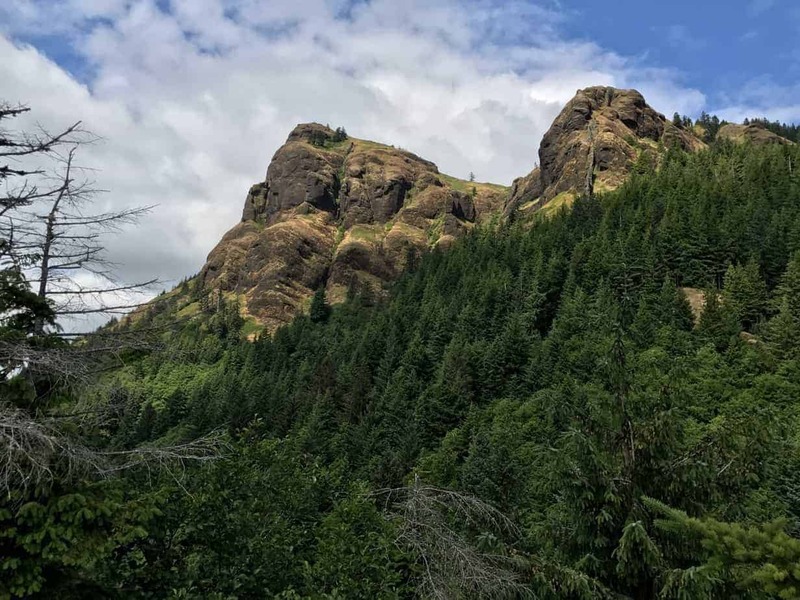 It’s a good 90-minute drive from Portland, out towards Seaside about 60 miles and then north on a road for Saddle Mountain State Natural Area. 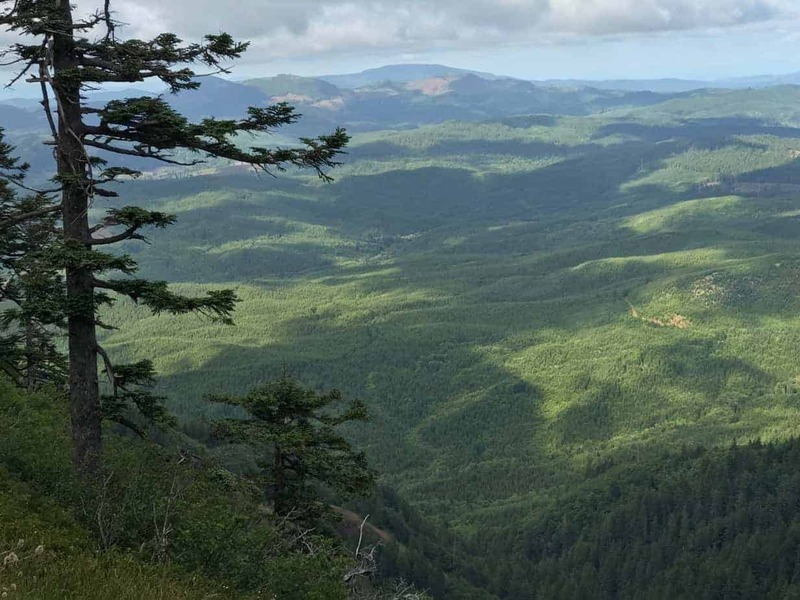 That road is seven miles long, windy, bumpy, and kind of a study in a thing called “viewshed.” That’s where loggers leave some nice big trees along the road and then utterly wipe out everything else. 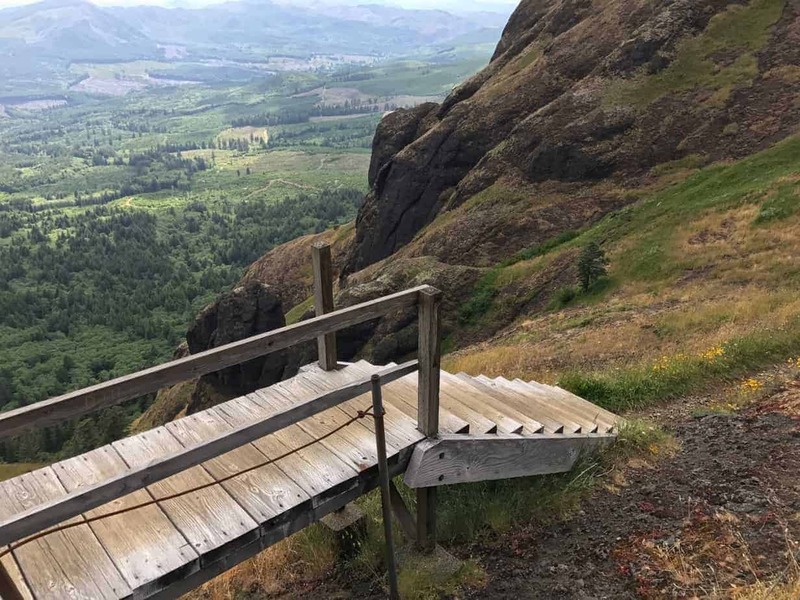 You’ll see this from up on the trail. 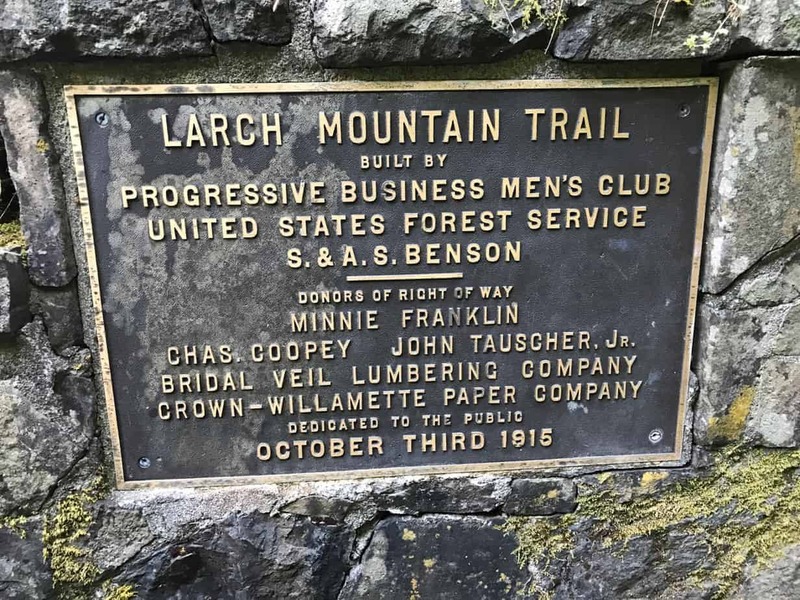 You start right out into the woods and, after a few minutes, come to a side trail on the right to the best viewpoint of the mountain in the whole park — the same one that’s at the top of this post. Go check it out, and admire all the oxalis (basically clover) on the forest floor around the junction. 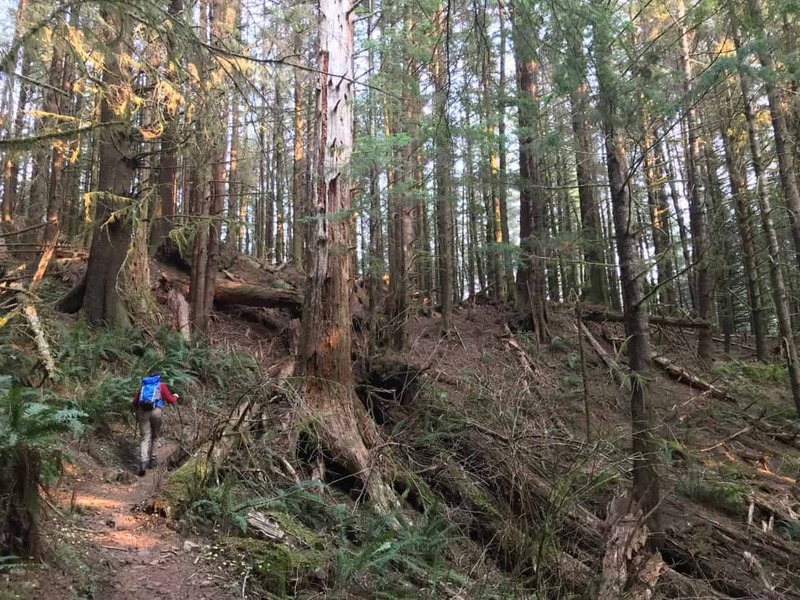 From here, the trail just climbs steadily, occasionally offering views of the (mostly logged) forest all around. Actually, it’s fascinating to see all the different areas of cuts, the length to which each has grown back, and the big areas that haven’t been cut in a while. A little more than halfway up, you start popping out into the open, and this is where the show starts. 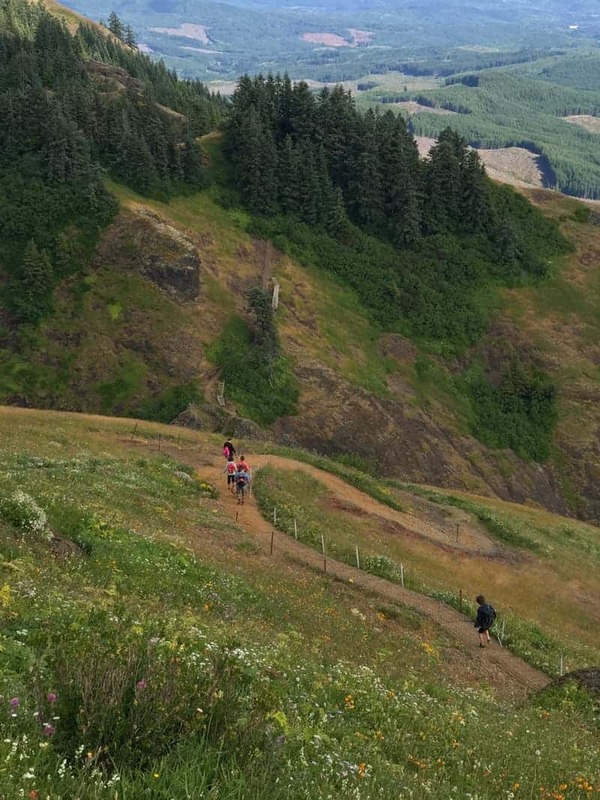 The flowers are one thing, the views another, and the amount of work that went into the trail is a whole other level. 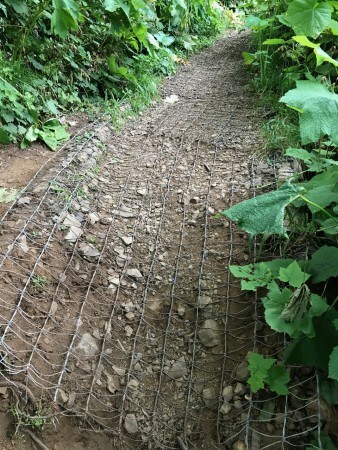 The fencing stuff you’re walking on in many places is called gabion. I used to think it was French, but according to Wikipedia, it comes from the Italian word for a big cage, gabbione. So instead of the J’aime le gabion I was prepared to write, let’s go with Amo il gabion! I am sure the trail, spared from much erosion, would also say grazie. All praise the gabion and gabion makers! For you will learn to love it, once you learn to trust it. 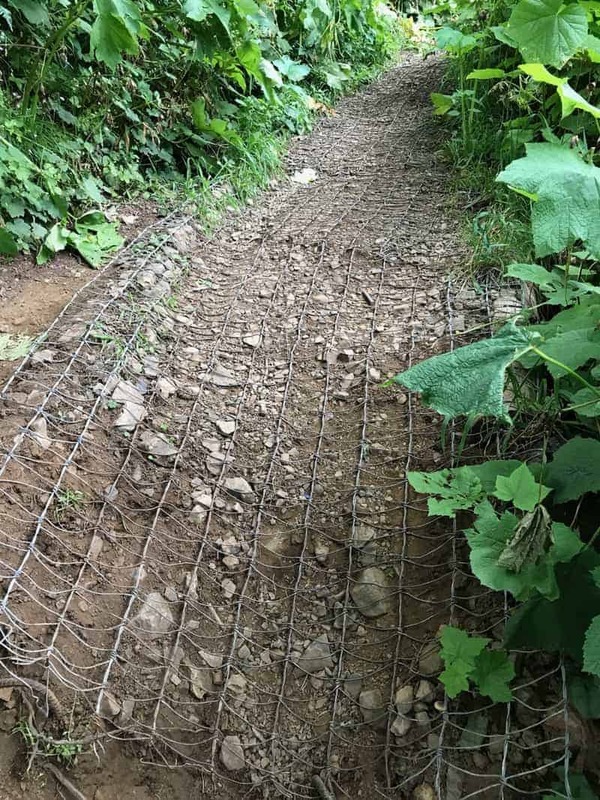 At first you may think that your shoes will slip on it; in fact, it’s the exact opposite (unless the gabion is wet, in which case go somewhere else!). 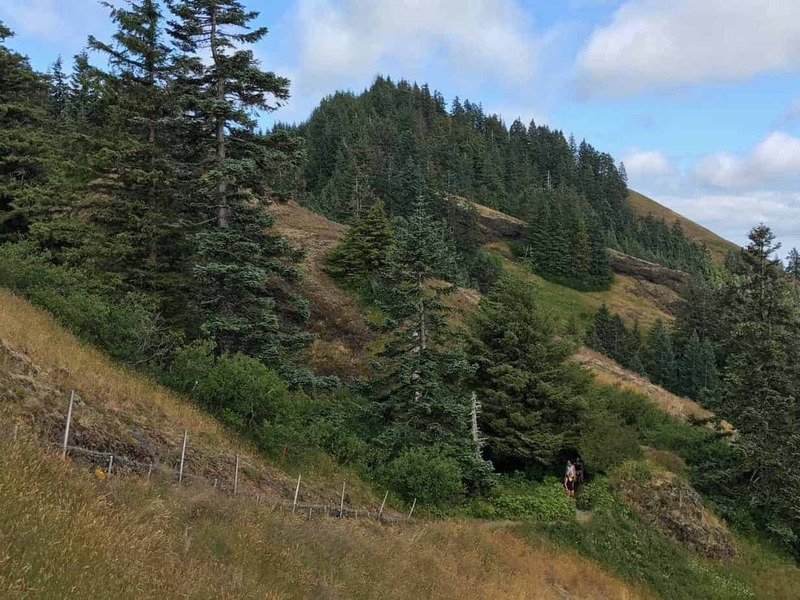 And those of us who can remember this hike pre-gabion should be walking the last half mile or so in a constant state of gratitude for whoever put this stuff in. For a taste of what used to be, just try walking off the gabion on some of the steep stuff towards the top, and imagine all of it being like that! It was somewhat gruesome. But I digress. 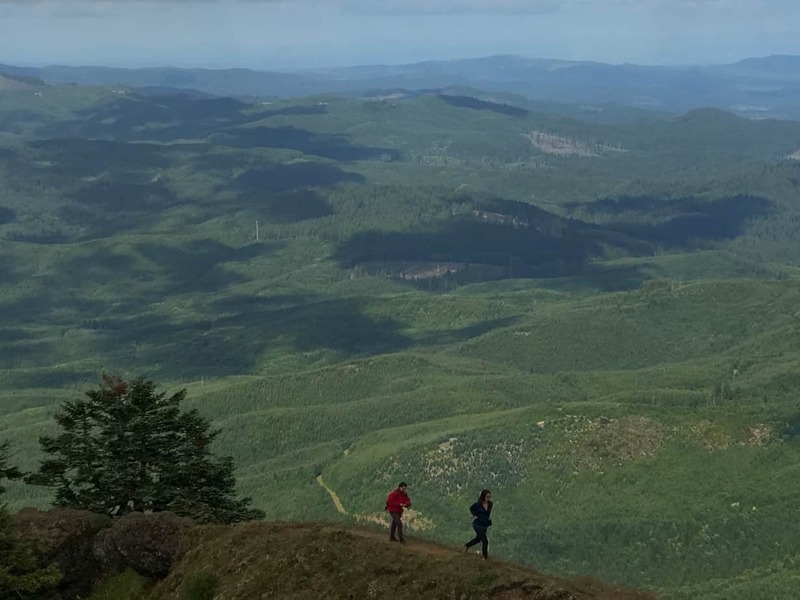 By now you will have realized why you slogged it up this otherwise viewless trail: big, big views, and meadows covered with flowers. And if it’s clear, you can see from the Olympic Mountains and Mount Rainier all the way down to Mount Jefferson. Even if it’s cloudy, which frankly it usually is, you should be able to spot the ocean and beach, Astoria, the river, and perhaps the Astoria Tower. 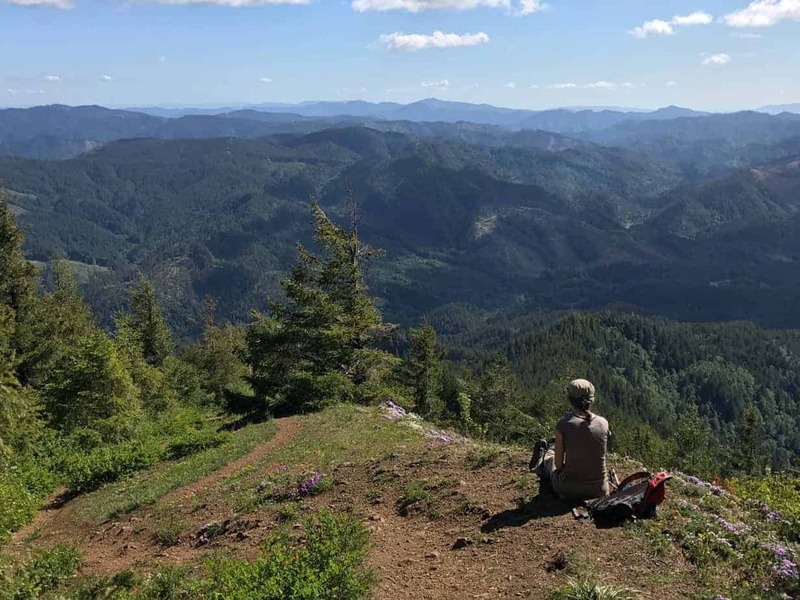 Now, when you head back, take my advice and at least stop at Camp 18. You may have driven by it and wondered if it was some kind of logging museum. Well, it is. It’s also a restaurant with a serious collection of wood statues, logging equipment, the thickest door this side of a European cathedral … In fact, it is something of a cathedral, complete with an incredible log that runs the length of the roof. 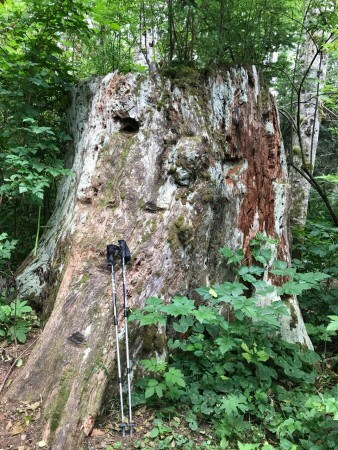 Notre Dame in Paris can have its flying buttresses; I’ll take the 85-foot, 25-ton ridge pole at Camp 18 … with a Lumber Jack Burger. I screwed up wth my phone, so I have no GPS track to share. 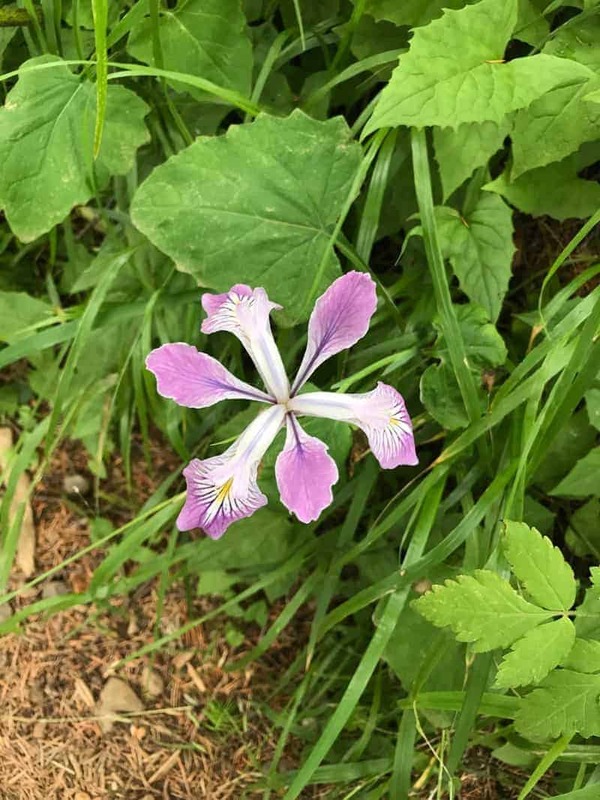 I do have a post from back in 2013 with more flower photos. 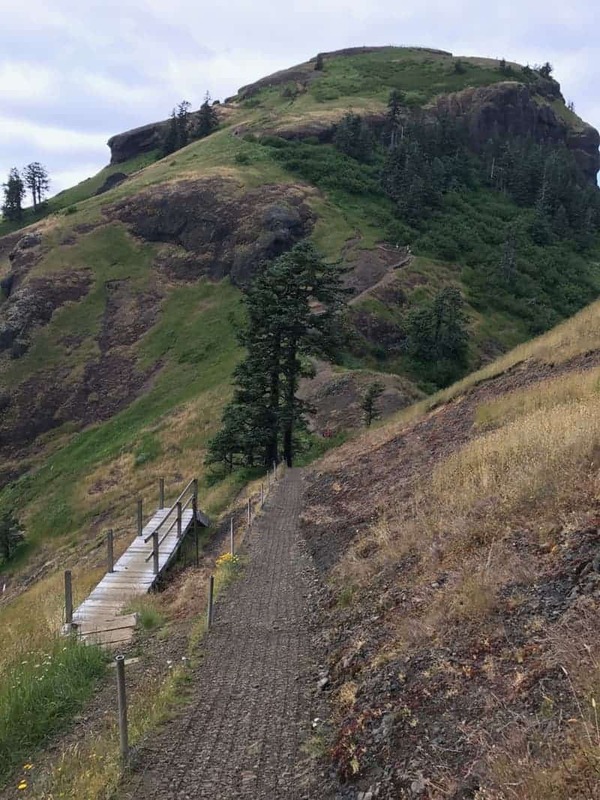 The best view of Saddle Mountain is actually from a side trail on the way up. Coming out into the meadows up top. This used to be the trail. Now it's a relic, I suppose. Love the shadows on the forest! 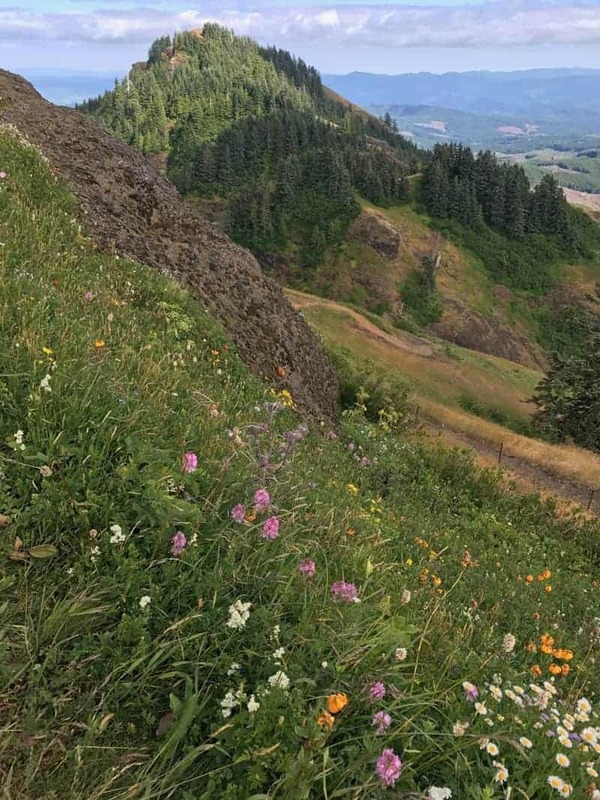 Flowers and views .. pretty much what Saddle Mountain is all about! This is so much scarier than it looks.